to accommodate a wider range of bodies. For clients who already own the the original regular size Far Infrared Dome, please note it was discontinued in early 2018 as it only fit bodies up to 180 lbs. The 'Grande' Dome is identical but larger so as to fit most all shapes and sizes, keeping everyone happy. Far Infrared (FIR) heat therapy - traditionally known as thermal therapy - is commonly used to promote circulation, relieve pain, for accelerated healing, serious toxin elimination, physical and mental relaxation, and to maintain and promote health and wellness on many other levels. Winter is a cold season when it is common for health complications to arise for many people, especially the sick and the elderly. The drop in temperature is a catalyst for health challenges. The SOQI Far Infrared Grande Dome pictured below, will help support the body to maintain health all year long. FREE E.Books, Video, x2 Height Risers, x2 Armrests. 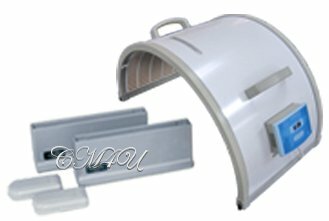 SOQI Far Infrared Dome Sauna - Grande Size. Low EMF, only 2.0 milligauss on TriField Meter. The Grande Far Infrared Dome Sauna has been created with cutting edge technology, exclusive to HTE. 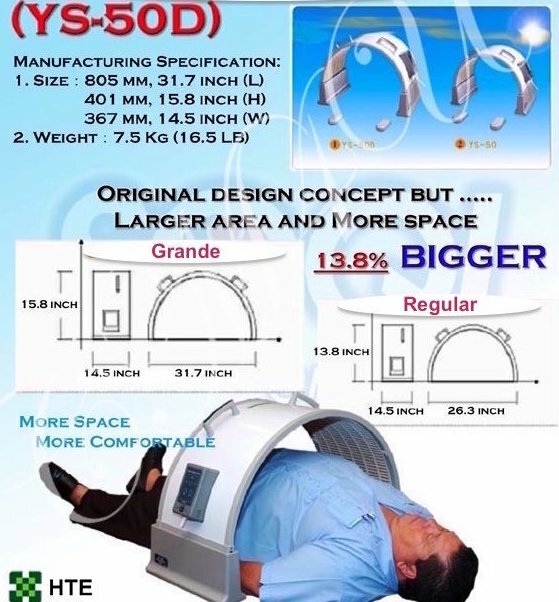 The 160 degree semi-circle dome, radiates 8-10 micrometer far infrared ray which are the most desirable wave length for human beings and pets. 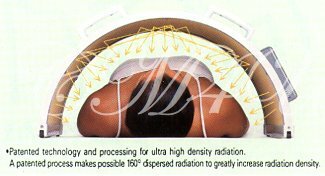 Far infrared heat ray resonate cells from the inside out, to maintain health and to promote natural healing and relaxation. Also known as the 'sweatless sauna' because far infrared thermal therapy emits 'dry' heat so you may keep your clothes on. This portable Far Infrared dome generates 100% far infrared heat which does not cause the body to sweat, unless you are normally prone to sweating. greatly increases the radiation density. The close proximity of the dome to your body promotes optimal far infrared benefits. Far infrared waves travel in straight lines, and the further away the less impact, so the closer to your body the better. No other Far Infrared sauna on the market compares, and none have them have been able to duplicate this advanced Japanese healing technology. The Original Far infrared Sauna. including pets, children and seniors. Health is especially important during wintertime, and throughout 'party season' - Thanksgiving thru New Year - which generates an overindulgence in food and drink, thus compromising the immune system. Lack of sunshine, activity, or sufficent warmth in cold weather, lowers the power of the immune system. Far Infrared thermal therapy may be used to support the body through this particular season, and to relieve aches and pains associated with cold temperatures. "I live in Maryland and the snow levels combined with extremely cold temperatures aggravate my body (i grew up in sunny California). The Far Infrared dome and the "Chi" (The Chi Machine), really made a difference by diminishing/relieving pain which flares up every time i have to go out in the cold. My husband is already in love with far infrared heat as it helped him deal with male problems he had last year. As advised, he changed his diet to mainly alkaline food (occasional grass fed beef or Alaskan salmon), juiced every morning, and lay under the far infrared heat nearly every evening for 1 to 3 hrs for several months. He is now completely well. We are both happy, healthy and sleep well. We use the Chi Machine everyday before breakfast for 10-25 minutes of aerobic exercise as a kick starter to the day ahead, and the SOQI Dome at least once or twice a week for one hour for health maintenance." - Kay Montgomery, MD, Winter 2013. "I broke my wrist in several places and used the dome to help relieve the pain before and after they repaired it and to support healing. The bones were reset and pins implanted. A year or so Iater, i then had a ruptured appendix (i didn't know), and endured hideous pain for four weeks which was only helped by using the far infrared dome which allowed me to get some sleep. I was eventually rushed into emergency to remove my appendix but ONLY after demanding the doctors re-diagnose what was causing my pain, as i had initially been given drugs and sent away! I used the dome everyday after the operation (one hour in evening), to promote my recovery and to relieve healing pains. During cold weather i use the dome for my wrist." - Rad, 28 years old, Los Angeles 2014. 1) BETALOE is a dietary supplement that provides a very strong support for the immune system. It is composed of two natural ingredients Aloe Vera and Beta-1, 3-D Glucan, which have both been independently researched extensively for their benefits and capabilities. Maintaining the immune system is important year round, but especially so during the winter months and holiday season. BetaLoe is an outstanding choice for those who need help. 2) Liquid Vitamin C (citrus fruits or liquid), and Vitamin D (from natural sunshine, or cod liver oil), are powerful natural preventatives that promote and support the immune system. All FIR Domes come with: x2 Height Risers and Armrests, plus Free E.Books and Video. 15.8 inch / 401 mm - floor to top. 31.7 inch / 805 mm - side to side. Facts, benefits and data from Japan. Heat therapy for cats and dogs. This website is for informational and educational purposes and is not intended to provide individual medical advice which may be obtained from your chosen health practitioner. Chi Machine International does not claim that any HTE product presented herein will diagnose, treat, cure or prevent any disease. Voluntary anecdotes from individual users sharing what they personally experienced, relevant to their lifestyle and state of health do not necessarily reflect results that other individuals may or may not experience. Always ask questions, research everything.